What Bracha do you make on Hafrashas Challah? When baking large amounts of bread, cake, or cookies, we are required to do Hafrashas Challah, separate Challah. This applies to any dough made from any of the Chameshes Minei Dagan (five species of grain), wheat, barley, spelt, oats, rye. 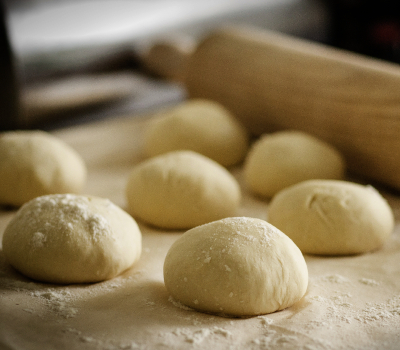 There are several opinions as to the minimum size of dough which requires the Bracha, however common practice is to recite a Bracha if five pounds of flour or more is used in the dough. Since there are several opinions on this amount, ask your Rabbi what your custom is. With a thick dough, one should separate Challah after kneading the dough but before the bread is baked, and with a thin batter that can be poured, the Challah is separated after the cake is baked. The procedure is as follows: One breaks off a small piece (approximately a K'zayis), and recites the Bracha. According to some customs, the Bracha ends with "להפריש חלה", and according to some it ends with "להפריש תרומה". After reciting the Bracha, one declares "הֲרֵי זוּ חַלָּה" or "הֲרֵי זוּ תרומה", and burns the Challah competely. For more info on this Bracha, Click Here to read more. Blessed are You Hashem our God King of the universe, who has sanctified us with His commandments and commanded us to separate challah. Baruch Atah Adonai, Eloheinu Melech Haolam, Asher K'dishanu B'mitzvosav V'tzivanu L'hafrish Challah. 🔷 For more info on the Bracha of Asher K'dishanu B'mitzvosav V'tzivanu L'hafrish Challah, Click Here.